Thank you for interest in the Montessori Children's House of Hyde Park. We look forward to introducing you to our school and getting to know your child and family throughout this process. Our admissions procedures are summarized below. The first step in the admissions procedure is to schedule a campus tour. This adult only tour, offers a first-hand opportunity to learn about our school, the faculty, and our curriculum. During this tour, you will get a chance to observe each of our prepared environments - The Primary, Lower Elementary, and Upper Elementary Classrooms. Following these observations, we will visit the rest of the campus, introducing you to our playgrounds and cafe. Lastly, we gather in the library to provide an overview of the school, further discuss the benefits of the Montessori method and address questions. Tours can be conducted at your convenience. Please contact us to schedule a tour. If you wish to pursue enrollment upon completing of the school tour, the next step in our admissions procedure is to submit an application form and schedule a student screening. A $50.00 non-refundable application/screening fee is due at this time. This fee can be mailed to the school or submitted during the student screening process. We use the student screening as an opportunity to get to know your child. During this screening process, your child will be introduced to the directress and the appropriate prepared environment. 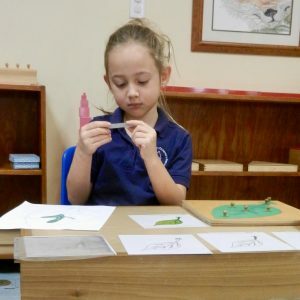 The two of them will spend approximately 20-minutes together exploring shown materials, allowing the directress to better understand the child and his or her unique needs. Student screenings are conducted at the end of the school day when the classroom environments are open and the directress' are available. The parent interview is the third step in our admissions procedure. Interviews are conducted with prospective parents only and are held during the school day. The interview takes approximately 30-minutes and is intended to get to know parents and the family environment better. During this time, the administration will further discuss the Montessori Method and talk to parents about the child in the home. At this time, any further questions can be answered. The final step in our admissions procedure is school acceptance. 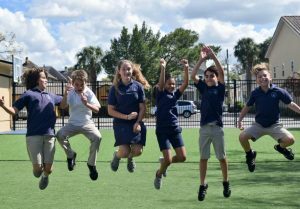 Admission to The Montessori Children's House of Hyde Park is determined after careful consideration of the appropriate placement of each child and the parents commitment to the Montessori method. Once it is decided that the child, parents, and the school are a complementary fit, an acceptance letter is granted, provided that there is space in the appropriate environment. Upon acceptance, a $100.00 non-refundable enrollment fee is due within 10 days, along with your signed school contract. Additionally, a $500.00 non-refundable tuition deposit is due, which is applied to the first year of tuition. If classroom space is not available, parents can opt to have their child placed on a wait-list. Waitlist applications are accepted at any time. There is a $30.00 non-refundable fee for this application. Applications can be completed online and fees mailed to the school. 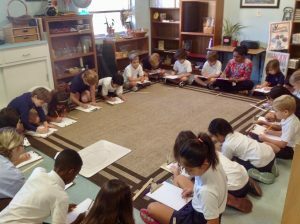 The Montessori Children’s House of Hyde Park has a non-discriminatory policy to race, color, orientation, or national origin with respect to admission of students and the employment of staff. We consider the records of all students to be confidential information available on request to parents and guardians. Records will only be released to other schools upon signed request by parent or guardian and only after all accounts are paid in full.